Join the Specs Howard Video Team at the 18th Metro Times Blowout! In it's 18th year, Metro Times Blowout continues it's run as one of the most legendary music events in North America. Thousands of bands from every corner of the musical spectrum play everwhere from the sweaty big stages to divey back rooms and everything in-between. 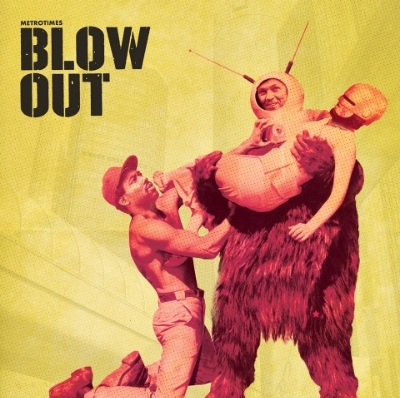 Blowout fans get to see their favorite local and classic acts and find incredible new bands too! Attention all Graphic Designer's and students in the Detroit area!! The Detroit Design Festival is sponsoring another Drinks X Design event on February 12, 2015. The event runs from 5:30 to 8pm at stArt Gallery in Detroit. This months event is also sponsored by AIGA Detroit. During this event, they are having a drink and draw! They will be providing markers, colored pencils, crayons and more. All skill levels are welcome. Space is limited so we recommend you pre-register here. Attendees must be 21+. Join the Specs Howard Video Team at the 17th Metro Times Blowout! In it's 17th year, Metro Times Blowout continues it's run as one of the most legendary music events in North America. Thousands of bands from every corner of the musical spectrum have played everwhere from the sweaty big stages to divey back rooms and everything in-between... where blowout fans see their favorite local, classic acts, and - this is the magic - their outrageous accidental and incredible new finds.